The weather in Manchester today is fantastic and there are lots of people out and about. Unfortunately I've been out at work today but I'm still home in time to appreciate some sun shine. 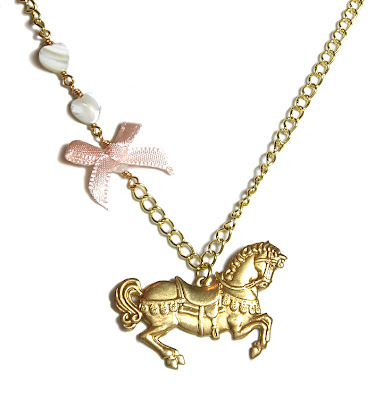 A new creation- My vintage style 'Carousel Horse' necklace, comprising of a Large vintage carousel horse charm, Mother of pearl hearts and satin ribbon, on gold chain. Another simple but stunning design, suitable for going out at night, or casual days! Available in my Etsy and Folksy stores later today!